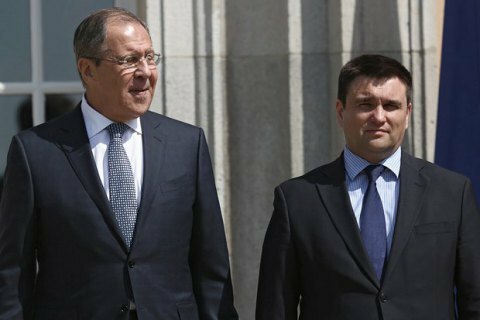 The meeting had to take place after Klimkin's meeting with Russian Foreign Minister Sergey Lavrov. Ukrainian Foreign Minister Pavlo Klimkin has confirmed that a meeting of the Normandy Four ministers of Ukraine, Russia, Germany and France on the sidelines of the Munich Security Conference has been put off. Klimkin said in Munich on Friday, 16 February, that the meeting, which was scheduled to be held after his meeting with Russian Foreign Minister Sergey Lavrov, would not take place, according to an UNIAN correspondent. "The meeting will either take place later [today] or, respectively, be rescheduled for tomorrow. We're ready at any time. I'm ready to meet even at three o'clock in the morning," Klimkin said. He also recalled that the French Foreign Minister would be represented by his authorized person. "We're now negotiating on how to agree, but this is because of the Germans' logistics," he said. He said the German delegation would not manage to return to Munich before 18:00 local time, when the meeting was due to begin. "Unfortunately, the German delegates wouldn't make it by 18:00, when the Normandy [meeting] was scheduled. We'll negotiate another timeslot," he said. The meeting was to address security issues, namely recent escalation in Donbas, and the humanitarian situation in that part of Ukraine. The release of Ukrainian hostages by Russia-led forces in Donbas and Ukrainian prisoners in Russia was also included in the agenda of the meeting. Hungary accuses Ukraine of "international smear campaign"
Turchynov: "I alone voted for the martial law in 2014"
Turchynov: "we had only 5,000 troops in February 2014"